Good luck walking to church on North Military Trail in West Palm Beach, if you happen to start on the other side of the street. Last February, Streetsblog readers determined the worst intersection in America. Then you pinpointed a suburban area with streets so windy and disconnected, it would take a seven mile trip to travel between two houses that shared a back yard. And for two years running you’ve helped shame the nation’s most parking-scarred downtowns. With some help from our readers and Twitter friends, we’ve put together a little collection of these divisive streets. Please share your own examples in the comments or send them to angie [at] streetsblog [dot] org. Here’s an unfortunate scenario in Cincinnati. A key stretch of Martin Luther King Boulevard operates much like a moat. On one side of the street visitors to the University of Cincinnati stay at the Hampton Inn. Almost directly across the street is University Commons — a park area designed to be a “contemplative space.” Wouldn’t it be nice if visitors had access? 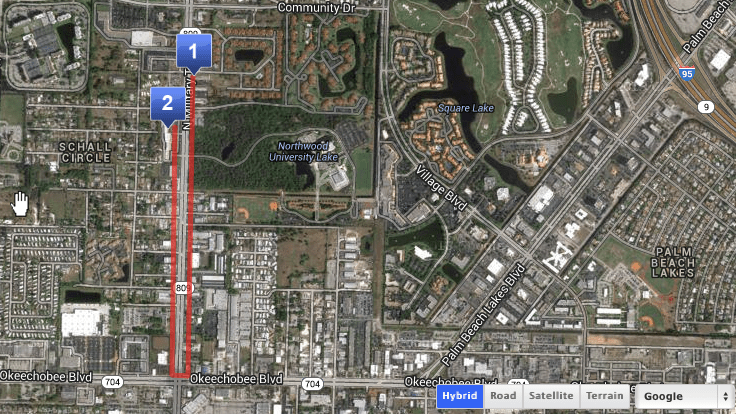 This submission comes to us from the excellent Florida Massacre Twitter account, which pointed us to West Palm Beach’s dreadfully isolating North Military Trail. Amazingly, this uncrossable barrier is right next to Northwood University. If you want to walk from Dollar General on North Military to Papa John’s pizza across the street, you’d have to travel 1.36 miles out of your way to access a crosswalk. Yeesh. This one comes to us from David Edmondson, who first blogged about the lack of crosswalks on this nine-lane suburban thoroughfare in 2011. Crosswalks are spaced about 0.3 miles apart on this stretch of Capital Boulevard. It looks like this road is a nightmare to cross on foot. To get from America’s Best Value Inn, on the west side of the street, to Starmount Mart on the east, you’d have to walk 0.28 miles. Got a good example in your own town? Shoot an email to angie [at] streetsblog [dot] org. Not that it makes it much better, but for North Military Trail, there is a cross walk at the top of the image at Community Dr. that would cut the walk down to *only* half a mile. I was in Miami recently. Crossing parts of Collins Ave was painful with a stretch of more than .3 miles without a marked crosswalk. Even when there was a crosswalk, they were mid-block and not at nearby intersections for some reason. The placement just made no sense. “A Crosswalk Too Far”. When I read that headline I immediately thought about this crosswalk in San Francisco. Treat Ave intersects Harrison Street at quite an angle, resulting in a 200 foot long crosswalk, next to a busy street. This is a painted crosswalk as long as 16 freeway lanes are wide. Why not walk a bit further and then cross the narrow and low traffic Treat Ave at a perpendicular angle instead? Most people probably will, but this block of Treat doesn’t have a sidewalk. Keep in mind this is San Francisco, a Vision Zero city. Not exactly a bad neighborhood either… Google’s moving in less than a crosswalk’s distance away. We’ll have to amend that for the final vote. Still, what if you made the decision to walk the wrong direction? According to Google maps, its almost a 7 mile trip to cross the street from these homes to this movie theater on Rt 1 in New Jersey. Not that theres any sidewalk to walk along though. Rutgers University is also right next door. If it’s any consolation, its a 3 mile trip by car to do the same, so really, no one is having a good time. At least the Harrison & Treat crosswalk is not the consequence of bad planning, but rather the fact that freight rail once cut through the neighborhood on what is now Treat Avenue. It’s also mitigated somewhat by the fact that Treat is basically a parking lot and not a major 8-lane arterial like some of the examples given in the article. This is goddamn awful. This area badly needs a pedestrian overpass (and sidewalks). I went to college in New Jersey not far from Route 1. It is utterly unwalkable along nearly its entire length. Pedestrian overpasses are useful tools for getting people past impermeable barriers like rivers, freeways, and even train tracks, but in the context of just getting someone across a street they are basically an admission of giving up on ground-level solutions related to traffic calming and walkability. In Austin there was a Target one could have walked to but for the fence, so people had to get on the highway an exit turn and around instead. I should have used the wire cutters instead. We all need to take little solutions like this into our own hands. Las Vegas is the worst for super expensive, smoky ped overpasses and an unsafe road with no bike lanes even below. Jesus. You win. This is the worst ever. That isn’t really a viable walking route due to all the high-speed slip ramps, anyway! That housing development is *completely* cut off; I-95 to the east, US-1 to the west, the Raritan River to the south. It gets worse: you have to go south to Sullivan Way to find the first pedestrian crossing of I-95. More generally, there’s a complete absence of sidewalks in the entire area. With lots of high-speed roads with no traffic lights, this area seems completely impossible. This area needs a comprehensive sidewalk system and it’s got nothing. I’m not even sure what’s the worst part of this. This is the first route I found which doesn’t look like a deathtrap. It involves heading east, crossing Hwy. 18 at Naricon Place, heading south all the way to Main Street (the first crossing of US 1 with a sidewalk), and then heading back north again and crossing Hwy. 18 again at Paulus St. It still involves cutting across some private property. And it’s EIGHT MILES TO WALK. Also: this is super-dense, highly populated New Jersey. TWO MILES from the New Brunswick train station on the Northeast Corridor. This whole area could be a walkable, bikeable paradise. But it’s not because you can’t cross US 1. I think US 1 in New Jersey is going to be the “winner” of this competition. According to WalkScore, the Hilton Garden Inn Downtown (Cleveland, Ohio) is in a “Very Walkable” location, so I’m not sure why it is in contention. Likewise, in Cincinnati there appears to be crosswalk of MLK at Vine. Still, the absence of crosswalks on all four legs of many of those intersections means pedestrians much cross numerous extra lanes. This medical building is about equidistant (0.35 miles) between Reliant Park and Smith Lands Red Line stations in Houston. One might assume it’s a toss-up as to which station to use, but the walk from Reliant Park is actually 0.9 miles. Along a transit corridor. The extended stay hotel across the street? Also nearly a mile. It’s 3/4 mile between crosswalks on Fannin (at OST and Holly Hall). Along a transit corridor. And block length/intersection density, which may not have any relation to sidewalk facilities. I know, I know. I was just taking this opportunity to point out how misleading WalkScore can be. You’re right — a situation like that one is especially painful because it is otherwise so close to being a good place for walking. If only someone in power thought that it were an important priority, a few well-placed fixes could make things SOOO much better, very quickly. A lot of Los Angeles is like that. Dense, packed with interesting places to walk to, but so often with dangerous crossings of busy arterials making it hard to get from here to there. You’re correct. In fact I’ve made the exact trip from (1) to (2) myself a number of times, and there’s a very easy crosswalk at MLK and Vine. There didn’t used to be, when Vine was set up as a “right in right out” situation with no traffic signal, but one was added there along with the crosswalk when they rebuilt the intersection a few years ago. That doesn’t mean MLK isn’t still a very pedestrian-unfriendly street, especially since the curb parking has been slowly whittled away over time. College Ave and Mission St in SF is a big and possibly deadly intersection due to a blind spot if you are heading south. I saw a family crossing the street when a speeding motorcycle almost took out the Mother and 9 year old son. Missed them by less than 1 feet. Four other family members had no choice but to watch their family members almost get hit. It was that fast. I think the one is Cleveland is a pretty weak example. Because the city has decided not to signalize those alleyways between 9th and 14th street, pedestrians from the Hilton have the burden of walking .21 miles instead of .09 to Aladdin’s. I don’t really consider either of those distances a “journey.” The reason it stuck out to me is I stayed in that hotel and found it a very surprisingly walkable location. Lots to do on foot within a mile. Roads in New Jersey are generally awful. I remembered I went to a motel near Atlantic City all the way from Philly, and it’s another side of the road. We had to drive like 2 miles to get to a jughandle to turn around. I cannot imagine how can the bicyclists or pedestrians cross the road. I think I’m going to disqualify that one because it’s a state highway with ramps and everything. Once you start talking about highways, this becomes really outrageous. We should do a separate contest for that because we got a few submissions along those lines. I’m confused over why you say the trip at MLK and Vine takes a 1/4 mile route, and is way out of the way. If you look at the map, there is a crosswalk right next to the Hampton, so you head north across the street and then west down MLK. No out of the way route, no extensive extra walking, its a one block walk once the street is crossed. Whoever told you this was a bad place to cross apparently can’t see a marked crosswalk with flashing lights. 2 tenths of a mile according to Google. Can’t exactly get any shorter than that. 1/4 mile = 2.5/10 mile, fairly close to 2 tenths…. The trouble with it is, it’s not a full expressway… it’s got intersections and stop signs and driveways and streetlights. These are killer stroads. An expressway is one thing, a street is another, but the mix of expressway-style slip ramps and local driveways is murderous. It makes it literally impossible to get to houses without driving. It’s the worst sort of road in the US and it should be illegal. In short, I think this road DOES qualify for the competition because *it has driveways on it*. It’s NOT an expressway, it’s not a freeway, it’s a road which has gotten overgrown with slip ramps. And if you don’t like that section, follow US 1 to the north side of the Raritan River. It has sidewalks in places, even. This last 1.6 mile gap has a bridge over it for Main Street — but it doesn’t have any sidewalks! Then it has a bridge for the “Middlesex Greenway”. So I’ll be fair: it’s only 1 mile from Prince St. to the Middlesex Greenway overpass. What makes all this much more egregious is how many subdivisions can ONLY be reached from US 1. (Just look at the Google maps.) There are no alternative routes. People living, working, or shopping in these subdivisions MUST take cars in order to get in or out. They’re like traps. To sum up: I think US 1 in New Jersey is the prime example of why we need Complete Streets ordinances. The STROAD character of US 1 has converted what should be a big net of walkable area into a bunch of little tiny isolated subdivisions where you can’t get between them. I think we need to add a new category to the state highway department’s classification of roads as expressways, arterials, etc. There is a lady walking on the shoulder at the northeast corner of US 1 and Adams street. There are no sidewalks and no crosswalks here. Also it is a stroad on steroids that is lined with businesses but has a concrete median divider like a freeway. It is horrible for cars to visit the businesses too. Like you said you have to drive a few miles just to get to another business directly across from where you are even by car. I did see sidewalks a mile here and there along this route. Allow me to tell you about the most egregious example of a least crossable street in Pittsburgh’s northern suburbs. McKnight Road (officially Truck U.S. 19, not to be confused with regular U.S. 19 on Perry Highway, a couple miles to the west), is a six-lane thoroughfare running through the heart of suburban sprawl. The section in Ross Township is six miles of commercial district — malls, fast food, chain stores, car dealers, and traffic lights. Though well served by a variety of bus routes, the ability to use any of these buses requires that one not only be able to access the bus from one direction of travel, but also the other direction of travel. Unless you should be so lucky as to have a bus stop adjacent to a traffic light, you pretty much just can’t. The worst case is a pair of bus stops on the northbound side of McKnight, opposite the North Hills Village shopping mall/plaza. Lots of people work at the mall or at one of the outparcel restaurants on the outskirts of the parking lot, closer to the road, and commute by transit. While four bus stops serve the mall on McKnight, these two in the middle of the northbound block are the problem. It is not uncommon to see a half dozen people exit a bus here, since the stops at the far ends are a very long walk from most of the businesses. There is a small median strip, no more than about four feet wide, between the fast lanes of McKnight. The trick is to get across northbound traffic, huddle on the median, and wait for a break in southbound traffic. While posted 40, left-lane speeds are routinely 50+, often 60+, both directions, as cars get up to top speed in the long stretch between the two NHV traffic lights. Of these two stops, the southern one is the more difficult. It is farther from the corner, and closer to the outparcels, Taco Bell and Applebees. To get to the light at the northern end is about a quarter mile of jumping parking lots, plus an at-speed peel-off onto Houston Road. Bicycling? Forget it. I myself am a regular bicycle commuter, and even I cannot stomach this area. Totally agree. From the Hampton Inn, the route could hardly be any more direct.